The Shore JackTM is a convenient and durable way to make structural repairs and to function as temporary support for various construction and remodeling projects. The shore Jack™ along with a 4” x 4” wood post cut to a custom length becomes a versatile adjustable column. ➊ Select the appropriate 4 inch by 4 inch (4x4 nominal) lumber based on construction documents. ➋ Measure the vertical height required for the Shore Jack™ Assembly. ➌ Subtract ten inches from measured height and use this new measurement for the length of the 4x4. a. Note: Shorter length 4x4s can be used; however, this will require more adjustment of the adjusting screw. The adjustment range of the shore jack™ is recommended a maximum of 4 inches. ➍ Insert the 4x4 into the square tube of the shore jack™ and install four 2-1/4″ inch 8d nails in the holes provided in the square tube walls. The nails will fit through the holes and shall partially penetrate the 4x4 holding the 4x4 to the square tubing. a. Note: If intending to reuse the shore jack™, do not drive the nail head flush with square tube, but leave the nail head partially out to allow for easier removal. This is not required if using wood screws. 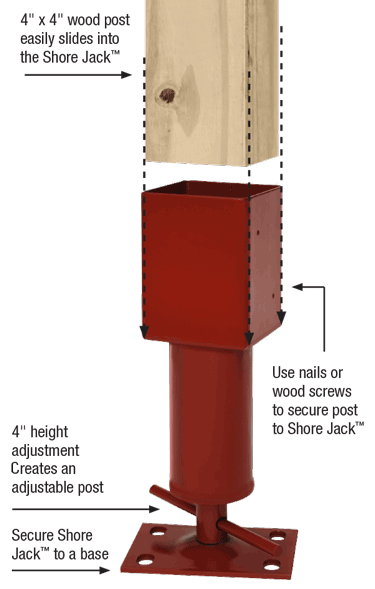 ➎ Make sure the shore jack™ is centered under the horizontal member (beam, joists, etc.) that is required to support. ➏ Turn the adjusting screw until the 4x4 is firmly supporting the horizontal member. ➐ Use a level to vertically plumb 4x4 and verify the 4x4 is centered under horizontal member. Use a 4″ x 4″ wood post and cut to desired length. 2. Nails are not included. Wood screws can be used in lieu of nails. 3. Connections to the foundation and supporting construction, if required, are per construction documents. Consult Local Building Codes.